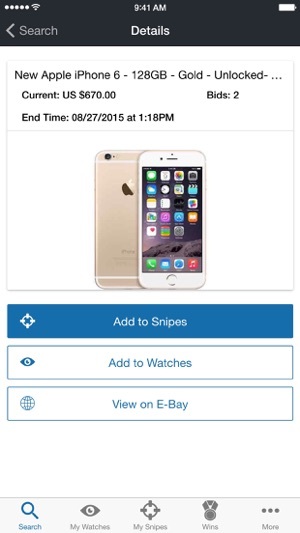 Snipe to win eBay auctions using Auction Sniper for iOS! • Save time by no longer having to watch the end of an auction. • Import eBay watches and easily place, edit and delete snipes. 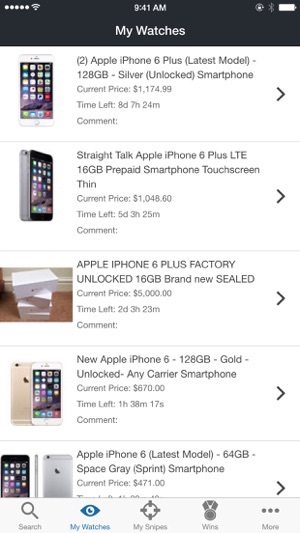 • App Notifications to let you know when you have been outbid, lose or win an Auction. • Sort searches by price, end time or newly listed. • Directly fund your Auction Sniper account with PayPal. Plus, you can try Auction Sniper for free! After you sign up, open the Auction Sniper activation email and click the "account activation" link to receive your 3 free snipes. After your first 3 winning snipes, you will be charged only 1.5% of the final auction price with a minimum fee of $0.35 USD and a maximum of $14.99 USD for only the auctions you win. In this release, we’ve made major changes to the way you connect your Auction Sniper account to eBay. This means faster snipes, a more secure connection and other added functionality & bug fixes. This is a great app to snipe, the act of putting in a higher bid in the last few seconds in the hopes that no one can put in one later than your bid. It works for the very well. It also lets you creat bid groups. 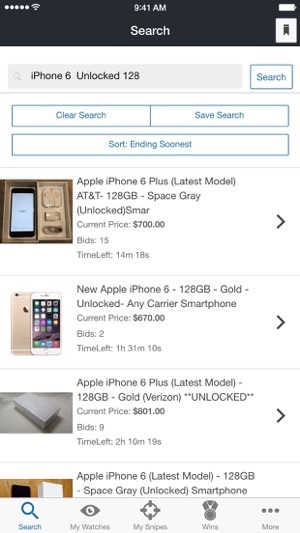 This is a VERY powerful feature that groups all bids for items you want to bid on, but only win a fixed number. For example, buying an iPad, and there are 12 available. Here, you set the max bid on each item you are willing to bid, and then group them. Then say how many you want. Say two. Auction sniper will keep bidding at the last moment until you have won two, and then toss out the rest. Because you have not ever bid on the others, no fear of winning too many. Lastly, Auction Sniper let's you set your maximum bid way in advance (plus a few bids over if close as an option) and then you look away. 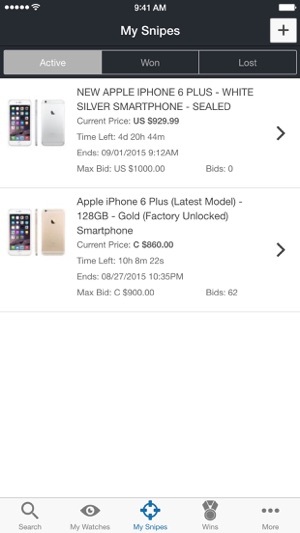 It helps YOU not spend more than you wanted because the item keeps getting bid up. You don't get sucked into a bidding war. It also tends to lower the price because there are no early on bidding wars by you upping the price. I highly recommend this for all three reasons, but the last reason is my favorite. This app I have been using for years to get the things I want for a price I am "wiling " to pay. I think of what I would pay for an item, then add or subtract how much I need it, then I just enter that amount in the system and this app does the bidding at the end in case I cannot. It also helps with "buyers remorse" too!